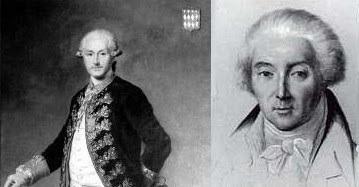 On this day in 1795 HSH Prince Honore III (left) passed away at the age of 74 in Paris and was succeeded by his son HSH Prince Honore IV. It was a dark time for the Grimaldi family; their French estates had been taken by the Revolution, many members of the family had been put in prison and Monaco itself was taken over by the French republicans with even the Princely Palace being seized and looted. Prince Honore III had been in prison the year before his death, which ruined his already weakening health. Prince Honore IV thus succeeded to his rights as Sovereign Prince of Monaco but could not actually take up that position and was a man without a country. He had been in prison when the Reign of Terror broke out and Honore IV was thrown in prison. His confinement was cruel and was to ruin his health to a large extent, even long after his release he was frail and sickly for the rest of his life. It must have seemed like the most hopeless position for Honore IV when he inherited the title of Sovereign Prince of Monaco; his family in prison or in exile, his country occupied, the family fortune gone and revolutionary radicals in control and preaching war and conquest. However, Prince Honore IV would eventually see his country restored but it all started with his succession on March 21, 1795.